How to gain competitive advantage in the year ahead. 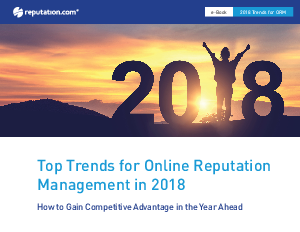 In 2017, review sources proliferated, consumers became more savvy about the validity of online reviews, and the position of Chief Experience Officer started to gain traction among location based organizations. ORM and SEO became increasingly intertwined as Google refined its search algorithms with a strong emphasis on reviews and star ratings. Google will extend its dominance in online review volume and consumer exposure, eclipsing all other specialty sites. SEO will be reinvented as user-generated reviews weigh more heavily in search rankings. The voice of the customer will no longer be siloed across disconnected categories. Consumer feedback from reviews and social media will drive operational improvements.